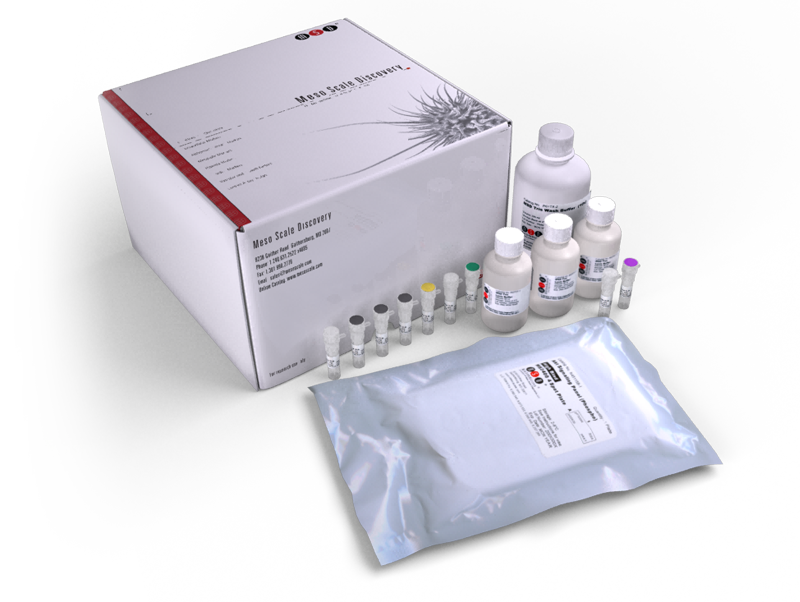 The Muscle Injury Panel 3 (mouse) Kit has been validated for the quantitative determination of endogenouse cardiac troponin I (cTnI), fatty acid binding protein 3 (FABP3), myosin light chain 3 (Myl3), and skeletal troponin I (sTnI) in mouse serum and plasma. The Muscle Injury Panel 3 (mouse) Kit is designed to distinguish myocardial damage from damage to skeletal muscle and other tissues. Troponin is a heterodimer that regulates muscle contraction in skeletal and cardiac muscle. Troponin acts with intracellular calcium to control the interaction of actin and myosin filaments in striated muscle fibers. When muscle tissue is damaged, the troponin-tropomyosin complex breaks down and troponin I is released into the blood. cTnI can be readily distinguished from its skeletal muscle analogs making it an excellent biomarker for myocardial injury and cardiotoxicity. FABP3 is a monomeric protein that modulates the uptake of fatty acids in cells. Heart-type fatty acid binding protein is released into circulation after myocardial ischemia and necrosis. FABP3 is mostly present in heart and skeletal muscle but can also be found in brain, liver, and small intestine. Myl3 is an essential light chain of the myosin molecule found in cardiac and slow-twitch skeletal muscle. After damage to muscle tissue, myosin breaks down and Myl3 becomes elevated in the blood. Myl3 can be used in conjunction with other toxicity biomarkers to confirm cardiac and slow twitch skeletal muscle injury. Doxycycline reduces cardiac Matrix Metalloproteinase-2 activity but does not ameliorate myocardial dysfunction during reperfusion in coronary artery bypass patients undergoing cardiopulmonary bypass. Biomarker panel of cardiac and skeletal muscle troponins, fatty acid binding protein 3 and myosin light chain 3 for the accurate diagnosis of cardiotoxicity and musculoskeletal toxicity in rats.